Pappada Vada is a typical street side snack food.The one which you may not find in high end snack shops/bakeries but you can spot these in big fat glass bottles,stacked neatly on top of one another in road side thattukadas.But I admit,I haven't tasted those so I am not sure if they use the same recipe or if it is indeed an 'authentic' recipe,this is how amma has been making it for years and one which gets over in no time. 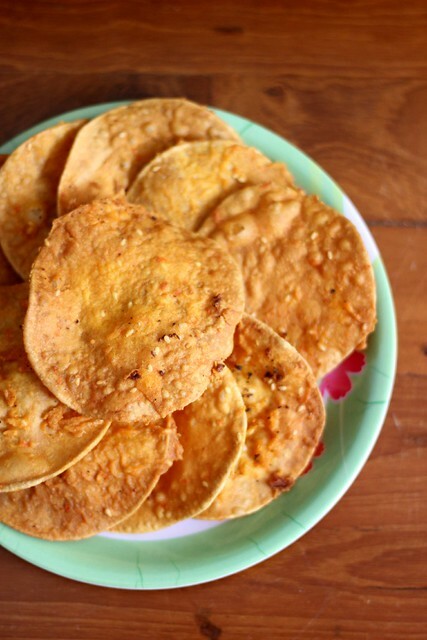 Usually amma made this during summer primarily to satisfy us,perennially hungry kids and secondarily because the scorching sun ensured the papads crisped up quite fast and according to her that is what makes the pappadavada crispy and tasty. 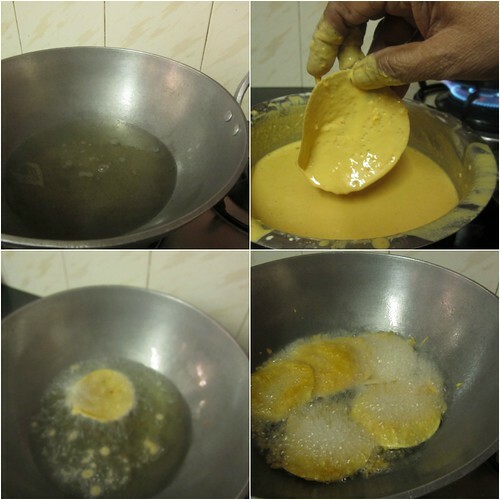 Make the batter - In a mixer/grinder grind together rice(soaked for 1/2 an hour),red chilly,haldi to a smooth paste.Add enough water as required-the consistency should be slightly thinner than dosa batter. Mix in hing,besan and salt to taste.Add the til seeds too. 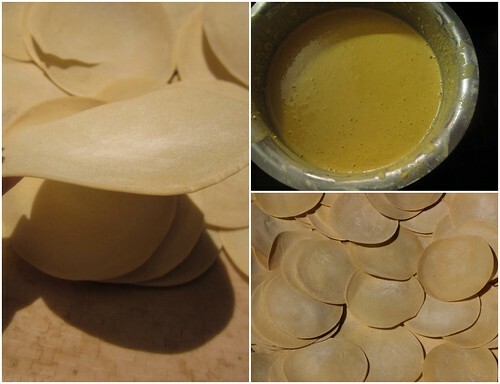 Dry the pappads in the sun for 15-20 minutes or until the pappads are completely dry and start to curl up from the sides. Keep a kadai with oil on flame and let it come to a smoking hot temperature. Dip the crisped up pappads into the batter,one at a time and put into the hot oil.You can fry up to 5-6 pappads at a time(if you have a big kadai with required oil). 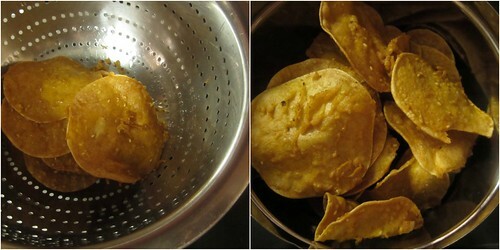 Let it cook on both sides till golden brown,remove from the oil using a slotted spoon and keep in a colander. It is very important to dry the pappads in the sun,if you use fresh pappads,it will puff up in the oil and would not be as crisp.The shelf life would be very short too. You can of course double the recipe to make a big batch-since this will stay fresh for a long time,it makes for a great store-ahead snack. 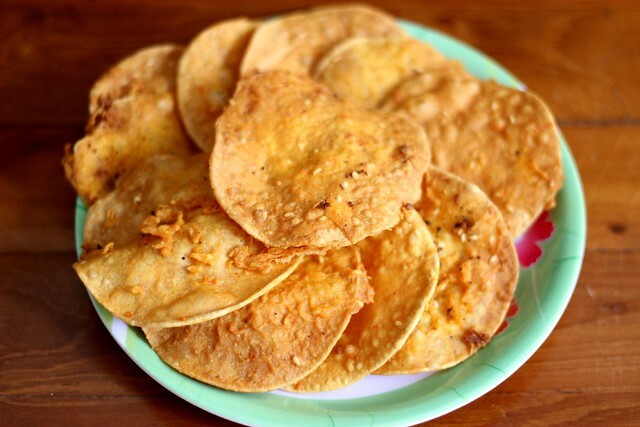 I hv seen this in a couple of blogs and found it interesting..ur post is tempting me again to try it..
hmmmmmmmmmmmmm very crispy papads and very inviting too. Delicious and mouthwatering vadas. Excellent preparation. 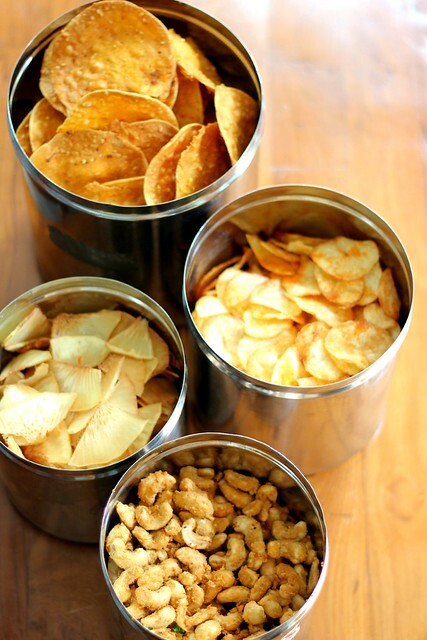 Super crispy and totally new for me..Quite addictive munchies. Very interesting. New to me..Thanks for the recipe.